Penguins are birds, in case you don’t know it. And yes, a lot of people don’t realize that. They are a group of aquatic birds that are known for their inability to fly. 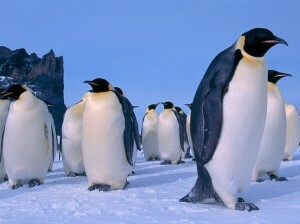 Penguins live almost exclusively in the Southern Hemisphere, majority in the continent of Antarctica. Penguins are completely unique to other bird species in a way that they are highly adapted for life in the water. Based on their looks, they have dark and while plumage while the wings have actually evolved into flippers, intended for swimming. Diet wise, penguins have also perfectly adapted to their environment, thereby making them thrive while feeding on fish, squid, krill, and other types of sea creatures. They get their food by swimming underwater. Even if all penguin species come from the Southern Hemisphere, it is not true that they are exclusive to those cold areas. As a matter of fact, only a few of them still live in the southernmost region of the Earth. To attest to this, it is known that more than ten species currently thrive in the temperate zone while there’s one specie called the Galapagos penguin that lives far north in the Galapagos Islands. Today, a large portion of the penguin population is found not just in Antarctica, but also in Australia, Argentina, Chile, New Zealand, and South Africa. There’s this popular question that asks if penguins do really migrate. The thing is there are some species like the African penguin that will return to their homes on land more or less every night in the entire year. Others meanwhile will reach their homes or colonies at the start of the breeding season. They then leave after the end of the season. There is really no definite research or study that elaborates where the penguins will spend the months in between. Hence, there is this theory that they migrate. Emperor penguins have been monitored using radio satellite transmitters on their backs. With this type of study, scientists found out that they swim around the Earth, specifically north of the Antarctic pack ice. – Penguins have been deprived of flying millions of years ago. But by developing highly capable flippers and streamlined bodies, they have become very powerful swimmers. – When they swim, they will leap in shallow arcs above the surface of the water. This behavior is called porpoising. – Penguins are carnivores. They naturally get food live in the sea. They eat several types of marine animals such as fish, shrimp, squid, and many crustaceans. – The eyes of the penguins will work better when they are underwater compared to when they are in the air. Therefore, they have superior eyesight compared to their prey while they are hunting. This goes true even when the water is rather murky or dark. – Finally, penguins are very sociable birds. They form breeding colonies that will reach tens of thousands of individual penguins.